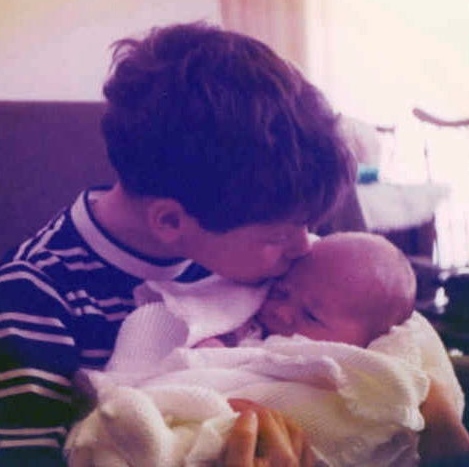 Fifty years ago today — September 16, 1964 — a baby boy was born. This baby was the third child of loving parents. The dad an engineer, fighter pilot, and athlete of 32. The mom a gorgeous young mama, who was not only incredibly fun but wise beyond her 22 years. They had three babies in just over four years. Oh they were done. Craig was it. The Huber Family was complete. I’ve had the privilege of witnessing the effects of having two older siblings dote on a baby. It does something to that baby — it infuses them with more personality than the rest of us. Craig soaked up all that love and all that attention, and in return he kept everyone in stitches. Family members near and far talk about how he was ALWAYS funny, always smiling. I guess they don’t know that he did turn mean one day: the day I was born. His anger wasn’t directed at me — evidently he was only mad at my mom. After all, he’d settled into his role as the baby for a comfortable seven and a half years. He was pretty ticked at my mom for the unintentioned recasting, but there wasn’t any animosity directed at me. And he very quickly gave up on being mad at her too. She isn’t someone you could possibly stay mad at. Plus, the words grudge and Craig are antonyms. Growing up, Craig was small for his age and I’ve been exceedingly tall all my life — we never looked nor acted seven years apart. He sucked his thumb so long I can remember hanging out on the couch and watching TV with him, marveling that it must be the best thing ever, because otherwise why would he do that? He was the funniest, sweetest, kindest person. My first thirty years were lived with the assurance that although he knew my faults he loved me anyway. No matter what. We talk about Uncle Craig a lot in our home, and you know who brings him up the most? My husband. He tells our boys all kinds of stories about how incredibly funny Craig was, how much he loved Craig. That means so much to me. I think if I just told the boys about Craig, they’d think, “yeah, Mom sure did like her brother, Craig.” But if Dad tells them, the stories have more weight. What a gift that my husband knew and loved my brother. And boy, did we have some laughs! Even now more than twelve years after Craig died in a small plane crash, I often know just what he’d say. I can be somewhere and see something all by myself, and know the line that Craig would use. I’ll smirk to myself as I imagine him saying it, sometimes I’ll break out laughing just as if he were there. I miss him terribly but I am grateful to have shared so many inside jokes with him that just because he’s on the other side of eternity doesn’t mean our laughs have ended. When I think about Craig, on this his 50th birthday, I am grateful for so much. I am grateful for the family I have left — my mom, my sister, my brother, Jeff. I am grateful for all the memories. I am grateful that Will and Craig were best buds and tried to spend as much time as they could with each other. I am grateful that Craig knew I was downright nuts about him. But most of all, I’m grateful that this life isn’t all there is. The hurts and sorrows and disappointments — which Craig knew in a profound way even though many only saw his humorous side — are not just left hanging. Life isn’t just trampled and forgotten like fallen leaves. Each life is part of a larger picture, one without end. Do you know what Paul said in Corinthians? He said that no eye has seen, no ear has heard, no human mind has conceived what God has prepared for us who love Him. (1 Corinthians 2:9). I hope you have the assurance of knowing you were no cosmic accident — you were made uniquely and in the very image of God, and He has a plan for you to live out on this earth. When this life ends, He wants YOU to spend eternity with Him. What He has prepared for YOU is beyond what you or anyone can even conceive of. But He is holy and you are not (I trust you know that). His Son, Jesus, died on the cross for YOUR sins. That unholiness of yours leaves a crimson stain, and separates you from God. Ah, but Jesus paid for it, all of it. He washed it white as snow. Christ’s righteousness is credited to you, if you make Him your Lord and Savior. Your sins are covered. All. Of. Them. You only need to accept the free gift He is offering you. Praying this morning that YOU will. I pray that you know the deep purpose and meaning that Our Loving Creator has for you in this life, and that you have the hope of eternity with the Person who knows and loves you best. Plus, I’d sure love to introduce you to Craig — you’ll love him. Beautiful, Kristie! Happy Birthday in heaven, Craig! Thanks, Anna. I’m looking forward to reading your book — I bought two copies at your church event and am just waiting to get word that they are ready to be picked up. Kristie, your beautiful writing never fails to move me! What a wonderful, loving tribute to your brother! Thanks so much, Bonnie. Your kind words mean to much. Your brother was just the best!!! I have so many memories of fun times spent with him!! He is missed by so many! Craig sure is missed! Not only did have many great memories with you, but he was nuts about your husband!